I was a big hot mess for a long time, because I kept trying to cure my son, who was also a big hot mess. Come hell or high water, I was determined to fix him, no matter what it took. I had to wake up to the fact I couldn’t cure his addiction. It took an ocean of tears, a tirade against God, a humble acknowledgement of my ego, and several years in a recovery program for me to get it. I resisted and resisted until I raised the white flag and surrendered to the illusion that I alone could save him. I reached out for help and learned about the disease of addiction. Thank God. As with most parents, I didn’t understand addiction when I was first faced with its harsh complexity and confusion. 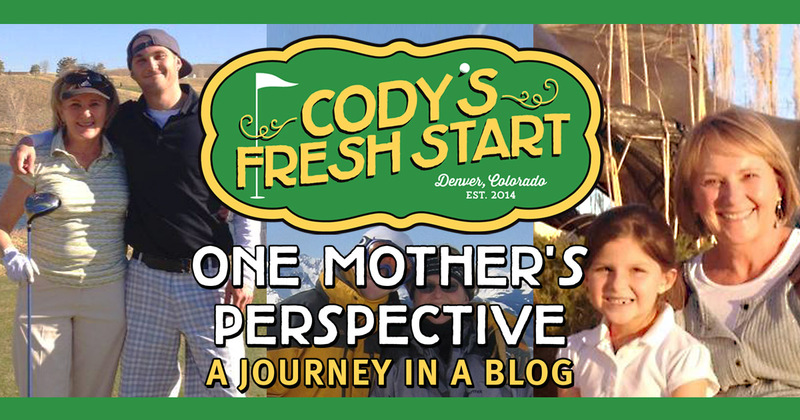 I was stuck in the stigma of blaming myself for Cody’s problems, which I couldn’t comprehend at the time why his misbehaving was so vastly different from other teenagers and young adults. His bad behavior was more severe and troublesome, with almost everything about him changing drastically – it seemed like I lost my sweet, innocent boy in an instant. I was constantly fighting against the guilt, shame, and fear that ruled my life. I couldn’t make my son stop drinking and drugging no matter how hard I tried or how much I sacrificed or how much I prayed for him. The waters were always turbulent, and we were both drowning in failure after failure, trying to sustain any moment of normalcy we could grasp. My peace of mind finally came when I accepted Cody was an addict and that I couldn’t cure his addiction. I couldn’t then, and I can’t now, change those harsh facts; addiction is a disease, relapse is part of it, and it’s a lifelong struggle for those afflicted. No doubt, it’s an unpleasant reality to accept those harsh facts, and at the same time it is the only way to stay out of the oblivion of denial. Coming out of denial can be extremely painful and awkward at first, but it makes choice possible, and when choice is possible, better decisions are made for everyone involved. Addiction requires treatment like any other disease and requires family members to learn how to live with it without enabling it. It will not magically go away with one stint in rehab – it is a lifelong disease, which needs attended to on a daily basis by the one afflicted, not anyone else. I had my own recovery to work on – still do. It was infinitely as important as Cody’s recovery – still is. Codependency does not instantly disappear with a loved one’s death or sobriety. Codependents are desperate to be loved and to take care of others, sometimes to the detriment of their own well-being. I realized I deserved peace of mind and didn’t have to be a big hot mess if I didn’t want to be. I had the ability to find and nurture new parts of myself if I wanted. I could stay a big hot mess or let it go, and permit a new expression of myself – a higher one. When I chose acceptance, the turbulent waters steadily became still waters – looked turbulent on the outside, but became still on the inside – my inside. My circumstances didn’t change, but I did. My journey was long and arduous, but it prepared me for what was to come, which was ultimately Cody’s death from a drug overdose. I had already awakened to the fact I couldn’t save him, and I knew death by overdose was a possibility. He had overdosed three times before he died, almost losing his life two months earlier to an overdose which landed him in the ICU. It didn’t lessen my grief, but I had what is called anticipatory grief – grieving before his actual death. Of course, grief (regular or anticipatory) can’t be banished by doses of optimism or sermons on positive thinking. It has to be acknowledged and worked through and validated as a healthy, normal human response to death. Grief runs on its own clock, but its power can be used – what once was despair becomes acceptance again. Peace is a natural outgrowth of acceptance. Whenever I feel like I am losing touch with Cody’s presence, I call my grief counselor and she helps put my spiritual life back on track. Her friendship and spiritual guidance have been invaluable to me, especially as it relates to death and the afterlife. She always tells me Cody is still here – he has only transformed from body to spirit – free of addiction. That single spiritual principle comforts me more than I can ever express. I love being reminded of it over and over again. I still feel gloomy at times and have my bad days, but I have accepted Cody’s death and am at peace with it. Your post are always so well written, insightful, providing many facts I never knew, personal, and so very tough & touching to read. This one really hit home about grief and remembering how our departed loved one are only gone physically. Their spirit lives on and a piece of them will forever be imprinted on our hearts. Thanks, Cehri (Jelly). I am glad it resonated with you, in particular about your mom – remembering death is only a transformation is very comforting. Love you, Mary (Butternut). Mary, you are one of the strongest souls I have ever met. Reading this post had a very positive impact on me (and anyone who reads it I’m sure). I’m glad you are at peace. Love you and always will. Thank you, Andy. It’s my faith that is getting me through this period of my life and I’m grateful I have such great support around me. Cody was always so proud of you and admired you. I’m glad this had a positive impact on you. Love you, too. Peace is a natural outgrowth of acceptance. What a concise and powerful sentence. I love the simplicity and brilliance of this. If only acceptance wasn’t so difficult. Thank you for your strength and inspiration Mary.